Are you looking for a more meaningful way to prepare your hearts for the Christmas season? Consider a Jesse tree. With this simple daily activity you can keep Jesus and the gospel message at the center of your holiday preparations. A Jesse Tree is a visual advent “calendar” that allows you to walk through the complete story of Christ (all the way back to creation) with your children during the days leading up to Christmas. Using handmade (or printed) ornaments, you can create a memorable keepsake that you can use for many years to come. There are a lot of resources available to you online if you simply google “Jesse Tree Calendar.” I won’t reinvent the wheel here for you, but I will give you a skeleton plan for using a Jesse tree advent calendar with your family this December. 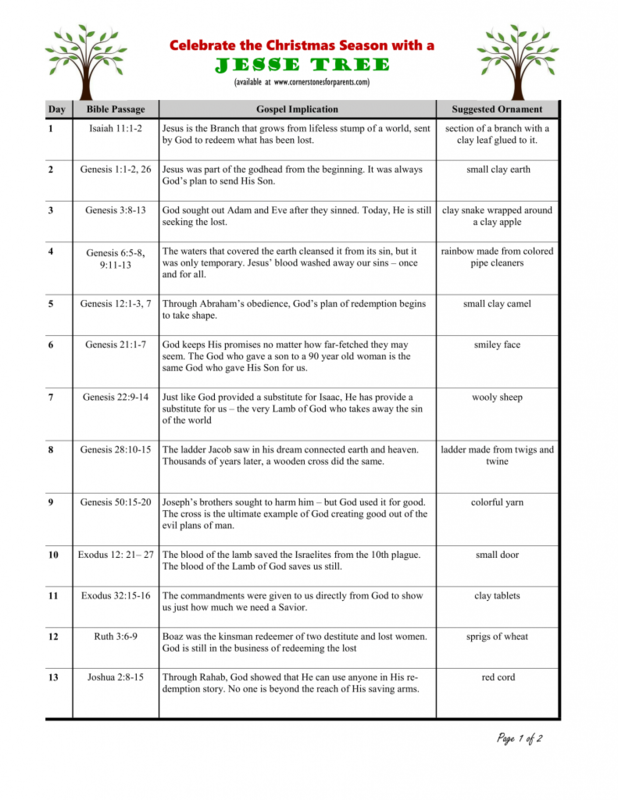 Here is a two sided free printable that includes the day, a Bible passage to read, a gospel application and a suggestion for an ornament (use your creativity and see if you can come up with something better!). If you are pressed for time, simply do an image search for each ornament using the keyword “clip art” and you will find some great images to print, hole-punch and hang on your tree. You can use a miniature fake Christmas tree or branches from trees in your yard in a vase, if you’d like. Find time each day this advent season to read the passage and talk with your kids about the birth of their Savior. Emphasize that this was not a random event or God’s “back up plan.” God has always been in the business of saving sinners. And His Son was sent to do just that. If you have older children, read the passage and then ask them to find the gospel application for each Scripture. It is a wonderful way to see God’s redemption plan woven through the entirety of Scripture. I like how you made a simple 1 sentence version of the Jesse Tree. 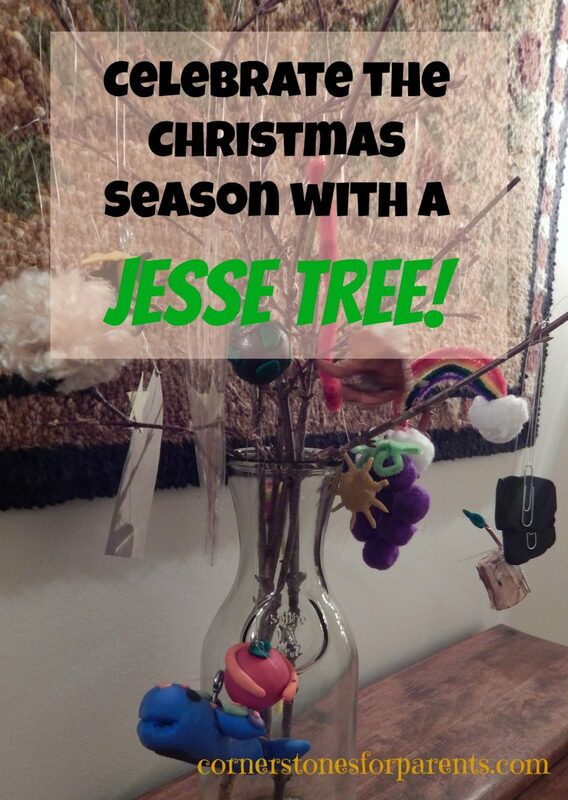 I’m really excited to be doing a Jesse Tree with our son this year, we went all out and actually wrote a book, make free printable ornaments, a whole Jesse Tree site… but even with all our enthusiasm like with a two year old is unpredictable, so even reading a short stories is sometimes tough. I love how your option gives a simple basic option for making a Jesse Tree. Hi Theresa – What a great resource you have provided for parents! I love your diy ornament ideas and would encourage any reader to check them out for inspiration. Thanks for commenting and for giving parents a great tool for instilling God’s eternal love for His people through the generations.